In this interview, Todd states he uses an Electro-Harmonix Electric Mistress Flanger: Who makes your equipment? The Harmonizer is an Eventide [265 W. 54th St., New York, NY 10019]. The flanger is an Electro-Harmonix [27 W. 23rd St., New York, NY 10010] Electric Mistress, and I'm using Tapco [3810 148th N.E., Redmond, WA 98052] graphic equalizers, and E-mu [3046 Scott Blvd., Santa Clara, CA 95050] synthesizer modules. The preamp is part of the E-mu setup. It triggers the synthesizer modules--the voltage-controlled filters, amplifiers, and so on. In the very early days of Police, Andy was using just the MXR Phase 90 pedal, and a reverb. As he became more successful, he got himself the Pete Cornish pedalboard, which had all kinds of effects programmed into it, including Mutron Envelope filter, wah wahs, fuzz boxes and distortions like EHX Muff Fuzz and Distortion+, MXR Dyna Comp Compressor, Phase 90 and others. He also used the Roland GR-300 Guitar Synthesizer. But, the two effects which were really the key to the Andy’s sound with the Police are the Maestro Echoplex tape delay, and the Electro Harmonix Electric Mistress. In this photo, we can see Waters with his rig, which also has the EHX Electric Mistress pedal. "We’ve been experimenting with new stuff lately, but right now my effects include Boss PS-5 Super Shifter and PH-3 Phase Shifter pedals, a Line 6 DL4 Delay Modeler, an Ibanez AD-9 delay, a Hardwire RV-7 reverb, an Electro-Harmonix Electric Mistress flanger…"
An Electro-Harmonix Electric Mistress was part of John Ashton's guitar rig in 1985. "sometimes sexed-up with an Electro-Harmonix Electric Mistress, a Schaller Phaser, or a wah pedal"
In [this interview with Perfect Sound Forever](http://furious.com/perfect/keithlevene2.html), Keith explains that in PiL's heyday, the only pedal he used was an Electric Mistress. 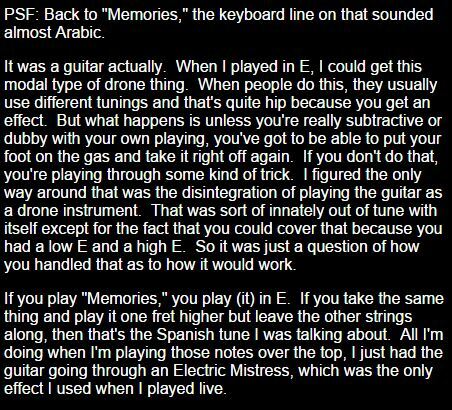 In [this interview from the November 2004 issue of *Guitar World* magazine](http://www.picturesofyou.us/04/04-11-Cure%20GW%20Interview.htm), Robert indicates that he used a Deluxe Memory Man sometime after he ceased using the Roland JC-120 amplifier and started using the Peavey Musician Mark III. "The first pedal I modified successfully was an Electro-Harmonix Electric Mistress. I changed the range of the speed and how it interacted with the positive and negative forms of the slope, and also created forced feedback within itself to oscillate and create noises. What really gave me a lot of knowledge was starting the effects pedal company. I used to take custom orders for anything, and that forced me to figure out how to build some projects that I’d agreed to do." There is (what looks like) an Electric Mistress pedal in the bottom left corner of the picture. Electro Harmonix Electric Mistress is included in the list of Gareth Jones' gear. its not stereo but unlike the new stereo version it actually sounds damned cool. Nothing sounds like the electric mistress other than the deluxe electric mistress. Total tone sucker in bypass. Big surprise there, right? !